Shooting Starz Gymnastics classes are taught by a staff of highly qualified and accomplished gymnastics and cheer coach professionals. All have long-term gymnastics and cheerleading experience in technique and curriculum both as competitors and as trainers. Team coaches is each Safety Certified and Background checked by USA Gymnastics All of our coaches are First Aid and CPR trained by the American Red Cross. Joelle D’Arco is the proud owner of Shooting Starz. She made her dream come true in July of 2009 when the doors were opened to Shooting Starz. Joelle originally comes from Boston where she a competitive gymnast/dancer growing up. She attended college in Western Massachusetts with a degree in Biology. Joelle is working on 18 years experience as a coach and loves coaching gymnasts of all levels. She has one daughter Lydia who also enjoys the gym in her class and a son Anthony. Her favorite event to coach is Balance beam. She is safety, CPR and AED certified. Looking forward to our 8th year of Shooting Starz GYMNASTICS. Dave D’Arco (Mr. DAVE) Is also the proud owner of Shooting Starz and has enjoyed every minute of it. In 2017 he began his Ninja class and it has grown incredibly. His Knowledge of gymnastics has grown along with his love for the sport. He will be seeing his own little girl compete in late 2017. Laura Plaviak has been with Shooting Starz Gymnastics for 8 years. She is our Progressive Program Director. Laura helps in making the SSG Class Program successful session after session. She also maintains a role at SSG as a Team Coach. Laura was a competitive gymnast in her younger years and holds the title for PA’s Level 7 Vault State Champion in 1997 and PA’s Level 8 Vault State Champion in 1998. Laura’s favorite gymnastics event is the Floor Exercise and her favorite gymnastics event to coach is Balance Beam. 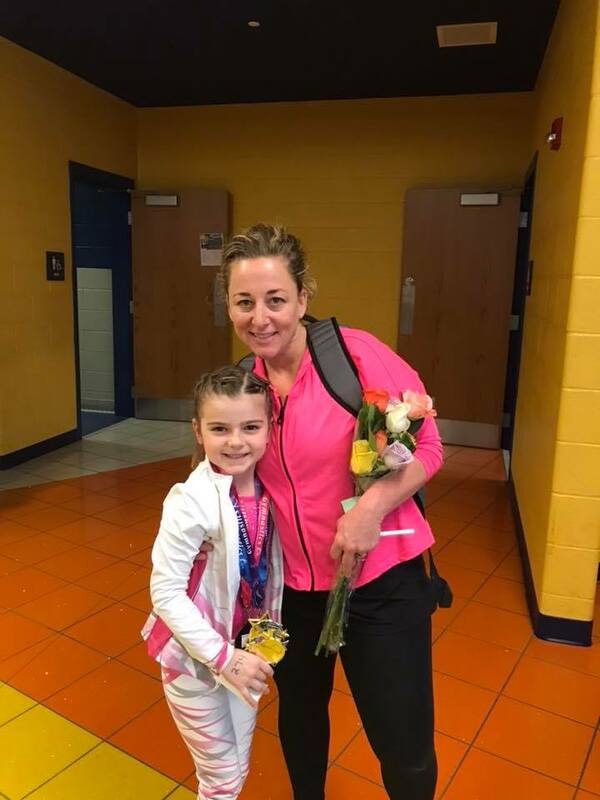 Her most treasured experience at Shooting Starz Gymnastics is watching all of the children in the classes, and on team, progress to new levels in gymnastics. Most of all, she enjoys the smiles and giggles from all the gymnasts at SSG! Ashlee Berry previously was a level 10 gymnast and was training for the elite level. She has been coaching all levels of gymnastics for 13 years, from mom and tot classes to level 10 gymnasts. Ashlee enjoys coaching all events but her favorites are floor and beam. She also serves as one of the team’s choreographers for beam and floor routines for the optional level gymnasts. Ashlee has attended several TOPs and elite clinics, and gymnastics workshops and trainings across the country. When not in the gym, Ashlee works as a full time pediatric Physical Therapist with her Doctorate degree from Misericordia University. Ashlee is safety certified through USA gymnastics. Ashlee is safety certified through USA Gymnastics. Sarah Plaviak was a competitive gymnast for 5 years and competed at level 8. Sarah graduated with a degree in Early Childhood Education, Elementary Education, and Special Education. She now works at Bear Creek school. Her favorite event to coach is floor exercise and she has grown to enjoy working with the optional team gymnasts. She has now taken on a bigger role at the gym and assists with running the Team program. Sarah has been coaching at Shooting Starz for 5 years and is CPR and AED certified and also safety certified through USA gymnastics. Sam Tencza was a competitive gymnast for most of her life, last competing at Level 8, preparing for Level 9. Sam is a four year UCA All American Cheerleader who enjoys coaching team at Shooting Starz. Haley Opet has been coaching at Shooting Starz Gymnastics for over 5 years and is currently the Level 3 team coach. She is a mother of two and was a former competitive gymnast under Joelle up until age 13. She loves to share her experience and knowledge of the sport. Haley has worked with every class in the progressive program at Shooting Starz and enjoys coaching children of all ages. Her goal as a coach is to provide a positive, educational, and exciting gymnastics experience for everyone! Tori Yazwinsky is a student at Bloomsburg University majoring in Early Childhood Education. She enjoys working with kids and is very outgoing, always motivated and smiling. Her energy is put to good use hosting the birthday parties at Shooting Starz! Ellen Modica has been with Shooting Starz since the fall of 2017. She is a veteran from Afghanistan. She finished her gymnastics career as a level 9 gymnast and has coached for 15 years. Lauren Emanski is a graduate of East Stroudsburg University with a B.A. in Spanish. She has taught Spanish both online and in a traditional setting. Lauren did competitive gymnastics for 10 years and cheered at Crestwood High School where she was awarded UCA all star. Currently she coaches adults in the health field and a level 2 coach at SSG. In her free time she enjoys spending time with her pugs and restoring antique furniture. Taylor Grozio is a level 9 gymnast at Shooting Starz and an honor roll student a Crestwood High School. Taylor has been with Joelle training as a competitive gymnast for 13 years. Currently, as the oldest gymnast in the program, many younger gymnasts look up to Taylor as a role model. Amongst other characteristics she exemplifies for the other gymnasts on the team, she has decided to share her sense of community &; love/knowledge of the sport by coaching her younger team mates. Taylor holds a Level 7 all around gymnast national title from competing in the State Games of America in 2013 along with other state titles. She has qualified for Level 9 States in 2015-2017 and was a Regional competitor in 2017. Kirsten Litchman has been with Shooting Starz for a few years now and loves working with the little ones in classes. She is a former gymnast under Joelle and was strong on the floor exercise. You will always see her smile in the class gym. Marissa McCune is a student at Crestwood High School. She began her competitive gymnastics career at Shooting Starz at age 9 as a Level 3 gymnast. Over the course of 4 years she quickly moved up the levels eventually retiring after completing her level 7 season. To highlight her career, she was the PA State Beam Champion (Xcel Gold). Although no longer competing, her love for the sport of gymnastics has kept her where she belongs. She hopes to give back to young girls that looked up to her as a gymnast and help coach them to be the best they can be. Vanessa Dankovitch is a senior at Coughlin High School. She was competitive gymnast at Shooting Starz Gymnastics where her love for the gym began. Her favorite events to compete as a gymnast were bars and vault. She was very determined to reach her accomplishments inside and outside the gym. She worked at her goals whole heartedly and now enjoys coaching classes and sharing her knowledge with the younger gymnasts. She especially enjoys inspiring the young gymnasts to reach their goals and putting a smile on their faces. She also plays lacrosse for Coughlin and plans on attending college in the fall of 2018. Kait Chmielewski has been with SSG July 2016. She has her Bachelor’s degree in Elementary Education for Bloomsburg University and currently teaches 6th thru 8th grade students. She was the cheer coach for Holy Redeemer High School for 3 years. Kait loves coming to see all of her student’s smiling faces everyday! Fiona Goeckel is a student at Coughlin High School. Fiona started her gymnastics career at age 4 and continued for ten years. She was on the competitive team with Shooting Starz Gymnastics for six years and trained up to Level 6. Gymnastics has helped her with other sports such as Track and Field where she is a pole vaulter. Fiona enjoys working at Shooting Starz Gymnastics because she enjoys teaching little kids and watching them progress. Tayna Brojakowski is studying to be a respiratory therapist. Her background is in cheer and dance. Tayna teaches progressive classes and has begun organizing our birthday parties. She enjoys working at Shooting Starz. Specifically, she loves working with the kids, teaching them new skills and seeing them succeed. Angie Roote is a former cheer coach and coordinator. She works with us part time coaching to help others explore and expand on their physical capabilities. Angie has a daughter Allie, who went through the Shooting Starz progressive gymnastics program and is now on the competitive Shooting Starz Team.